Comm Eye Health Vol. 11 No. 26 1998 pp 26-27. Published online 01 June 1998. Randomised controlled trials are the most straightforward of studies to design and interpret. They are often considered to be the ‘gold’ standard of clinical and epidemiological studies. This is because, if they are conducted properly, it is often possible to be fairly sure that the results are correct, at least for the type of patients who took part in the study. Good clinical trials are almost always randomised and controlled. The study design need not be limited to clinical situations, however. It is possible to investigate questions of relevance to communities, such as the effect of health education, for example, using a randomised controlled design. 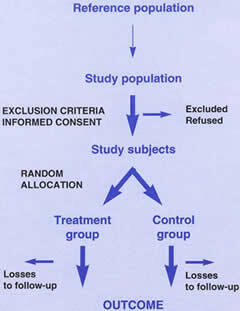 Figure 1 sets out the basic design of a randomised controlled trial. There are many good textbooks on the topic, for example, Pocock’s Clinical trials: a practical approach.1 A sufficient number of fairly representative patients are randomly allocated to two or more treatment groups and followed up over an appropriate period of time. The outcome of interest, for example, vision or visual impairment, should be measured by people who do not know to which treatment group the patient was allocated. If possible, the patient should also be unaware of which treatment they have received. Physicians and patients are often concerned about the ethics of withholding/subjecting treatment to half the patients. Random allocation of treatment in a randomised controlled trial requires explicit acknowledgement that it is not known which treatment is more effective; this may be difficult for an individual doctor or patient to accept. However, if there is no clinical consensus, with the result that a person may be treated differently depending on which doctor they consult, the study replaces random delivery of health care (at least from the patient’s point of view), with a positive contribution to helping future patients. It is better to do a trial when a treatment is new as not only are fewer patients exposed to a treatment that may be dangerous, but also, fewer doctors and patients will have strong beliefs about whether it works. It is important that patients are fully informed as to the advantages and disadvantages of the treatment options, and the fact that treatment will be allocated randomly, before they give their agreement to take part. They must also understand that if they decline to participate then their health care will not be affected in any way. Otherwise, their consent cannot be considered to be freely given. Whilst most people are concerned with the ethics of randomisation, it is not well recognised that the proper design, conduct and reporting of trials is also a question of ethics; weakness in these research activities may mean that patients are harmed because incorrect conclusions about treatment are reached. The aim behind randomisation (or random allocation of treatment) is to produce comparable treatment and control groups. If it is effective, both known and unknown confounders* will be equally distributed between the two groups. This is the reason why the randomised controlled trial is such a powerful study design – other epidemiological studies depend on the measurement and statistical analysis of known con-founders. Statistical techniques may not always control confounding adequately, especially if the confounding factor is not measured very well.4 Powerful biases* can be introduced into non-randomised studies, or indeed into randomised studies if clinicians are aware as to which treatment group the next patient is to be allocated.3 An understanding of the rationale for randomisation is critical, not only for interpreting the results of trials, but also for understanding the problem of interpreting observational non-randomised studies. It is very important that all trials conducted are reported properly in the medical literature. Several international collaborative efforts are underway to ensure that all data collected during trials is made easily available to people making decisions about health care. The CONSORT statement consists of a checklist and flow diagram, intended to assist authors, editors, and reviewers by ensuring that information relevant to the trial is included in any study report.7 Many of the world’s major medical journals, including the BMJ, The Lancet, and Annals of Internal Medicine, have joined together in calling for all unpublished trials to be made available and have provided a mechanism for reporting of unpublished studies. * Confounding occurs when the groups being compared differ with respect to another factor or ‘confounder’ which is associated with the outcome (or disease) under study. Bias may be defined as any systematic error in a study that results in an incorrect result. Both bias and confounding can be thought of as alternative explanations for the observed effect. 1 Pocock SJ. Clinical trials: a practical approach. Chichester: John Wiley & Sons, 1983. 2 Simes RJ. Publication bias: the case for an international registry of clinical trials. J Clin Oncol 1986; 4:1529-41. 3 Chalmers I, Dickersin K, Chalmers TC. Getting to grips with Archie Cochrane’s agenda: all randomised controlled trials should be registered and reported. BMJ 1992; 305: 786-8. 4 Leon DA. Failed or misleading adjustment for confounding. Lancet 1993; 342: 479-81. 5 Chalmers TC, Celano P, Sacks HS, Smith H. Bias in treatment assignment in controlled clinical trials. N Engl J Med 1983; 309:1358-61. 6 Hennig A, Evans JR, Pradhan D, et al. Randomised controlled trial of anterior-chamber intraocular lenses. Lancet 1997; 349: 1129-33. 7 Begg C, Cho M, Eastwood S, et al. Improving the quality of reporting of randomized controlled trials: the CONSORT statement. JAMA 1996; 276(8): 637-9. 8 Evans JR. Translating evidence into practice: the Cochrane Collaboration and the CONSORT statement (editorial). Eye 1998; 12: 2-3.